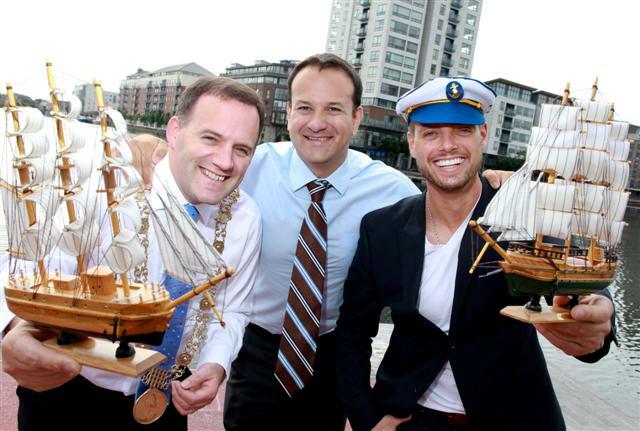 Minister for Transport, Tourism & Sport Leo Varadkar joined “First Mate” of The Tall Ships Races 2012 Dublin, Keith Duffy, Lord Mayor of Dublin Naoise Ó Muirí to announce details of the free four-day festival in Dublin. Over 40 Tall Ships will sail into Dublin, the final host port in the race, for what promises to be Ireland’s biggest festival this summer from August 23rd – 26th. The Tall Ships Races 2012 – Dublin, will see the city come alive with a festival atmosphere both on and off the water. Local organisers, Dublin City Council and Dublin Port Company are delighted that Dublin was chosen as the final host port of The Tall Ships Races and have programmed a bustling entertainment line-up to cater for all tastes. Launching the event, Minister for Transport, Tourism & Sport Leo Varadkar said: ‘It’s great to see the Tall Ships back in Dublin again after 14 years. This fantastic event is set to attract thousands of people into the capital. It’s a rare opportunity to see so many of these great ships against Dublin’s striking city skyline. Events like this are very important for tourism companies, and I’d like to congratulate everyone involved in bringing it to Dublin. It’s fun, it’s free of charge and it’s open to everyone’.